One bag travel theoretically allows you to use public transit systems with ease. But how do you negotiate all those bus stops and transfers in a strange city? My answer is the MetrO app by Kinevia. This app will work on and off line and has over 400 city routes available for download. I have used it to ride both the Paris Metro and Washington DC Metro. I can easily recommend it. And bonus points – it’s free! All of the app cities may be downloaded ahead of time by WiFi or by phone data. The routes are routinely updated so you will have the latest available schedules – just make sure you perform a download/update right before you travel. Using the app is easy. Select your city. Next enter your starting point and destination. The app defaults with the current date and time, but you can enter a different date and time manually. 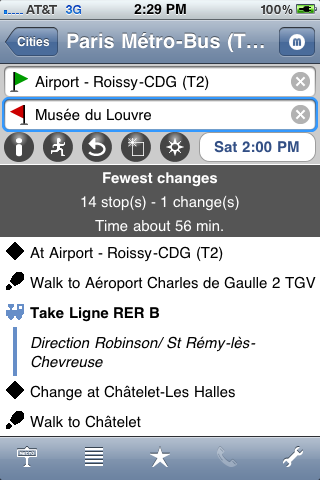 This will allow you to check availability of transit for other times (important for planning late night trips)! Some cities have points of interest in the database as well as the transit stops – great for people who don’t have familiarity with their destination. The points of interest are in bold print. One of my biggest problems with public transit is knowing which direction to take on a particular line. After all, bus and train lines have a number and a direction. That direction is usually to the end of the line, and I have no idea where that is. The MetrO app solves this problem by giving you the line number, the direction, and the station name that you stop at. On top of that, it tells you how long it takes to get there. The app displays both the shortest (fastest) route and the easiest route. The easier route usually takes longer but has fewer transfers. It is nice to have this option when you are new to a city and just learning the system. The app will display the route twice if the easy route and the fast route are the same. This app has several other functions. 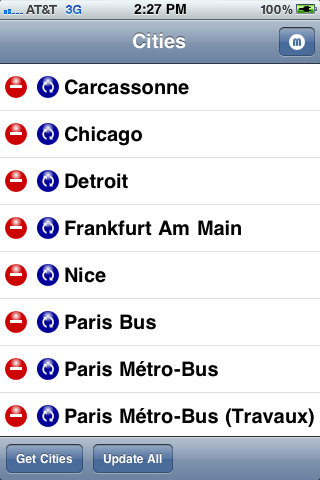 For example, it will display all the stops on a particular route. This gives you an idea how many stops will occur between the beginning and end of your trip. The app is well supported by the Kinevia web site. They have complete instructions on how to download cities and use all of the functions. It is available on multiple platforms, including iPhone, Blackberry and Android.